A Do-It-Yourself Farmer Grows Strawberries In The Air : Goats and Soda The West Bank resident liked the elevated, computerized planters funded by USAID. But he wanted to figure out a way to build the system without relying on grants. 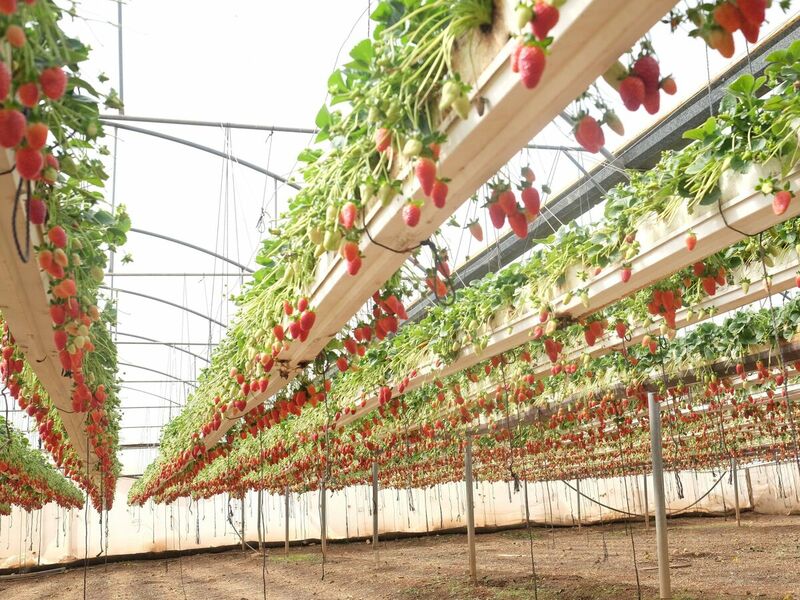 An elevated strawberry farms in the West Bank city of Tulkarum, funded by a USAID program. Hezam Kittani didn't want U.S. handouts to help him grow strawberries. He wanted to be a do-it-yourself berry farmer — and to teach others to follow in his footsteps. Strawberries were barely grown in the West Bank, where Kittani lives, before 2009. Today they're a 250-ton yearly crop. And that's because of $705,358 in grants from USAID for farmers in this "lower middle income region" (as classified by the World Bank). The USAID money offered a helping hand for farmers to set up a new way to grow the fruits — in hanging planters where pests can't get to them as easily as on the ground and with "a computerized automated drip irrigation system that accurately measures the optimum amount of water needed." The berries grow in a mix of perlite and peat moss. The system has a number of advantages. Elevated strawberries stay warmer than strawberries in the ground, which means a relatively long season, from November through April. And the plants grow downward, so the berries are easy to harvest. Outdoor strawberry farms yield about 12 tons of strawberries per acre; hanging strawberry plants in greenhouses yield three times as much. Hezam Kittani (left), the do-it-yourselfer who created his own aerial strawberry system, and Mustafa Barakat, the Palestinian Ministry of Agriculture's strawberry expert. But Kittani thinks there's a big disadvantage to the current setup. He doesn't want local farmers to rely on foreign aid. He wants them to succeed — to help themselves and the economy — without outside help. That's why Kittani set out to design a version of the USAID elevated strawberry system that Palestinian farmers could easily (and inexpensively) replicate themselves. He began watching YouTube videos and doing trial-and-error experiments to find a system that farmers could pay for themselves and that would still yield lots of berries. First, Kittani built planters from the same plastic boards used in USAID-assisted strawberry farming, but the process was labor-intensive, Kittani says. "It was hard to construct because you have to cut it in pieces and find how to stick it together." One video suggested sewage pipes as planters. So Kittani bought pipes, drilled holes in them and lined them with plastic cups full of strawberry plants. But the pipes ended up costing more than the plastic boards. Kittani kept experimenting. Eventually he settled on wooden beams wrapped with white plastic sheets — the cheapest materials he found. "I try to make it more practical and easy to construct to train neighbors how to do it," he says. Kittani fills his channels with soil he calls "ideal," a mix of coconut shells, peat moss and foam balls. He learned about it on a video series on the University of Arizona website. The biggest challenge was building a computer-based irrigation system similar to the expensive USAID model. Kittani asked his daughter's high school science teacher for advice; she told him about a market that sold irrigation timers for around $30 each. He taught himself how to code and programmed a computer with similar nutrient and water measurements as the USAID system. The result was a $500 automated irrigation computer, about a third of the cost of the USAID model. USAID's objective is the same as Kittani's: to boost the local economy, create jobs and make Palestinian agriculture globally competitive. In response to Kittani's project, a USAID spokesperson said the organization applauds innovation and is pleased that an entrepreneur is trying to develop a new system: "Our goal is to make this program self-sustaining so that farmers will be able to do this work in the future without USAID's assistance." Strawberries and almonds (pictured, raw) are popular crops in the West Bank. Kittani is still fine-tuning his strawberry operation. He's working with local researchers to develop a strawberry plant tissue culture, a technique used to grow whole plants from plant cells. And Kittani recently rigged a smartphone app that's connected to a device in the soil to track irrigation and pH levels. He's researching solar panels and wants to install internet using local SIM cards instead of a wireless router so farmers without internet or electricity can send and receive information from smartphones. "It's called smart irrigation," Kitanni says. He pauses. "No," he continues. "We will call it smart farming." 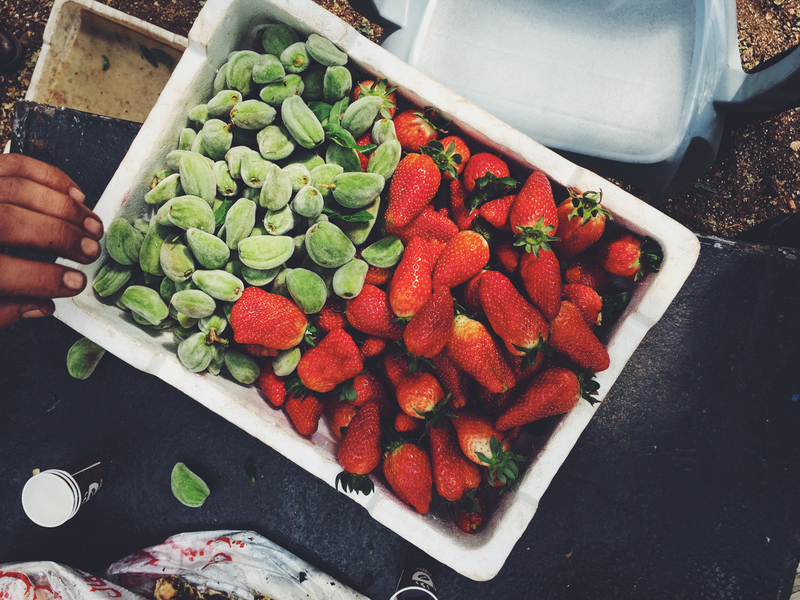 This year marked the first full strawberry harvest in Kittani's backyard. Five farmers have come to him for advice. None of them have replicated his strawberry system from scratch, but they are asking him how to make their farms more affordable and resource-efficient. And the strawberry is just the beginning, Kittani says. Next up: "We need to study the pineapple."